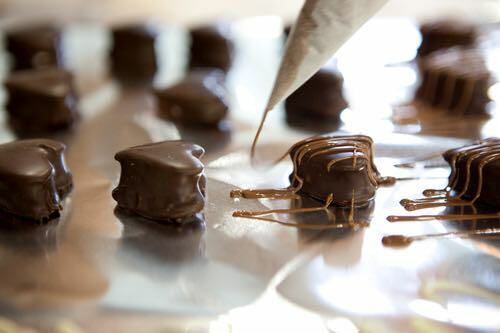 Learn how to make chocolates with the help of these old fashioned chocolate recipes. 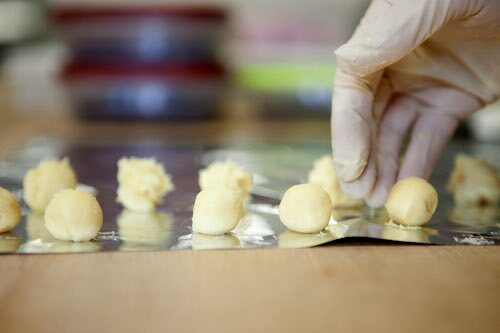 You'll find it easy to make your very own homemade bonbons and fondant candies that will rival the taste of any you can purchase in the stores. Your hand-dipped chocolates will make perfect gifts for giving on St. Valentine's Day, Christmas, birthdays, or any special occasion. Simply by altering the fondant coloring, flavoring, and the shape of the fondant centers, you can make a wide variety of fancy chocolates and old-style bonbons. When learning how to make chocolates, have every item needed convenient before boiling the sugar, as you must work very rapidly after the candy is cool enough to manipulate. Four cups of best granulated sugar (white) to which add 2 cups of boiling water and one-fourth teaspoonful of pure cream of tartar. Stir until dissolved, but do not stir while boiling. Boil until three drops fall slowly, a thread slowly forming from the third drop. Also watch the bubbles break slowly as it boils. If it threads directly from the spoon with the first drop, it will revert to sugar. If a thermometer is used, it must reach 40º Baumé; i.e., 70% sugar content (about 238°F). A little experience without a thermometer will give success. Skim the sugar while boiling, also the sides of the kettle with a wet cloth on a fork as the scum arises. Do not boil too briskly, but moderately. When it threads pour into the flat dish, from which the water has been perfectly drained just before removing the candy from the fire, and add one teaspoonful of glycerin to each cup of sugar, and one teaspoonful of vanilla, or any flavoring desired: If two flavors are desired, divide the candy. Do not scrape the bottom and sides of the boiler, when pouring it out. When the finger can be held in the candy with comfort, knead back and forth with a batter cake turner until it "bucks." This work must be done rapidly and evenly, having the dish level. When impossible to move the mass, use forks to mash it; then knead with hands until smooth. This is called stock fondant, and it will keep a month in a cool place, and can be worked into fancy candies, but I prefer to mold while slightly warm. Do not handle too much. Some of this white stock fondant may be molded into squares, rounds, diamonds, wrapped around a whole almond, or other nuts, rolled in grated coconut, dipped into chocolate coating. Or, made in layers one-fourth inch thick and four inches long, with a layer of dried figs between, and when cold cut into diamonds, etc., or a layer of pineapple may be used. Add a touch of pink paste to white cream, also violet, yellow, green, and chocolate to white cream. Make two layers of white with either color between, as fancy dictates, and cut into shapes or make into balls. Trim the sides of the layer before cutting, and the ragged edges can be put together, forming striped blocks of several colors, whereas the layer only showed white and pink, or some other color. Melt chocolate for brown, make into shapes, and place halves of walnuts on top of all colors and whites. Make pink balls and squares, let them get firm, and dip into melted white fondant, which gives a pretty effect. Chop raisins, add spices, and mix in white fondant; place between layers of white or colored fondant or cream. Remove seed from dates and raisins and fill with white and colored cream, roll in granulated sugar. Strips of coconuts may be placed on top or worked into cream also. Rose water, pineapple, banana, and orange are nice flavorings, and wintergreen is liked by some. Same as plain cream fondant, except use 1 teaspoonful of cream of tartar to 1 pound of maple sugar. Two cups of white and 1 cup of maple sugar to 1 cup of boiling water. Proceed as for plain cream only add mixed chopped nuts just before it "bucks." Shape into squares or make a layer between white or colored cream and cut into squares. A cake of Baker's® bitter chocolate, 2 ounces of cocoa butter, melted together — sunshine heat, never over hot water — to which add confectioner's sugar until thick enough. Pound vanilla bean in the sugar before sifting it, and warm the sugar before mixing with chocolate. This mixture can be slowly melted on the back of the stove. Stir it constantly. By means of a needle or pin, dip the shapes of white and colored creams into this mixture and drop on paper. Hold on pin until it almost ceases to drop. Bars of cream dipped into this coating with a nut on top are nice. Nuts may be inside the shape also, or it may be rolled in coconut while the coating is soft. Equal parts of sweet and bitter chocolate, melted. This is delicious and less trouble. Brown blanched almonds and dip into coating. Instead of the old fashioned cornstarch molds described below, specialized chocolate molds are available for sale online and at most candy-making stores. They come in hundreds of shapes and sizes and are perfect for use with these old time chocolate recipes when learning how to make chocolates. Use a tin funnel 7 inches long, 4-1/2 inches across the top, and 1/4 inch at bottom, with a stick, similar to a pencil, through the center to close the outlet, and to be raised and lowered to emit a small quantity of melted of fondant into small cornstarch molds. The funnel looks like the letter "V" and has a handle on the side. Getting to hand dip your fondant candy pieces into the warm, melted chocolate has to be the best part of learning how to make chocolates. It's simply so much fun. 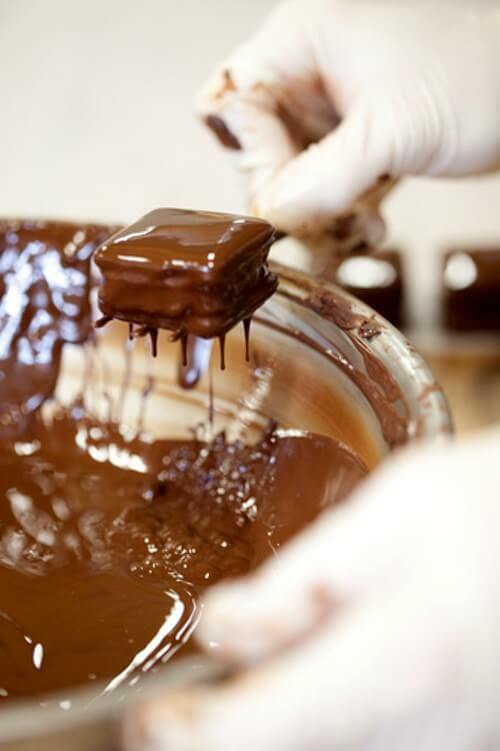 The best ingredient to use for hand dipping chocolates and bonbons is what's called dipping or melting chocolate. This meltable dipping chocolate is often called compound chocolate, and it's much easier to use since it's not a pure chocolate. Compound chocolate has a low temperature melting point and contains a wax-like component that makes it easy to work with and lets it harden into a crisp, shiny shell after dipping. It is slightly more expensive than pure chocolate, but it is not as finicky and frustrating to work with, yet it makes a delicious chocolate coating. Compound chocolate is sold in break-apart bars or wafers at most cake decorating and candy making stores, and it's sometimes available at bulk food stores at a very reasonable price. It's sold in milk chocolate, dark, and white chocolate varieties, and it can be purchased in over a dozen different colors depending on the brand. Merkens®, Guittard®, and Nestle® are some of the brands. Baker's® also sells a fine dipping chocolate that you can use when learning how to make chocolates. These old fashioned chocolate creams are perfect for hand dipping when learning how to make chocolates. You will enjoy nibbling on these luscious homemade creams, and they are easy to make too. Put butter into granite saucepan; when melted add sugar and milk. Heat to boiling point; then add chocolate, and stir constantly until chocolate is melted. Boil thirteen minutes, remove from fire, add vanilla, and beat until creamy and mixture begins to sugar slightly around edge of saucepan. Pour at once into a buttered pan, cool slightly and mark in squares. Or, omit vanilla, and add, while cooking, one-fourth of a teaspoonful of cinnamon. Beat the whites of two eggs to a stiff froth. Gradually beat into this two cupfuls of confectioners sugar. If the eggs be large, it may take a little more sugar. Flavor with half a teaspoonful of vanilla, and work well. Now roll into little balls, and drop on a slightly buttered platter. Let the balls stand for an hour or more. Shave five ounces of Walter Baker & Co.'s Premium No. 1 Chocolate and put into a small bowl, which place on the fire in a saucepan containing boiling water. When the chocolate is melted, take the saucepan to the table, and drop the creams into the chocolate one at a time, carefully taking them out with a fork and dropping them gently on the buttered dish. It will take half an hour or more to harden the chocolate. For these creams you should make a fondant in this way: put into a saucepan one cupful of water and two of granulated sugar (or a pound of loaf sugar). Stir until the sugar is nearly melted, then place on the fire and heat slowly, but do not stir the mixture. Watch carefully and note when it begins to boil. When the sugar has been boiling for ten minutes, take up a little of it and drop in ice-water. If it hardens enough to form a soft ball when rolled between the thumb and finger, it is cooked enough. Take the saucepan from the fire instantly, and set in a cool, dry place. When the syrup is so cool that the finger can be held in it comfortably, pour it into a bowl, and stir with a wooden spoon until it becomes thick and white. When it begins to look dry, and a little hard, take out the spoon, and work with the hand until the cream is soft and smooth. Flavor with a few drops of vanilla, and, after shaping, cover with chocolate, as directed in the preceding recipe.